Chateau Le Pin: 81 points. Ridge Vineyards Cabernet: 75 points. Heitz Chardonnay: 55 points. The fascinating thing about flipping through Robert Parker's 1987 Wine Buyer's Guide, which I bought for a song on Ebay, is the way he rated wines all the way from 50 to 100. "Lanessan produces wine of a big, rich, gutsy style that often lacks finesse but more than compensates for that deficiency with plenty of power and flavor authority." This is a period when some wineries released flawed wines, something that rarely happens today, and Parker dings those wines with scores in the 50s. That's admirable, part of the good role he played in helping force wineries to make improvements in hygiene. Those aren't the noticeable scores, though. 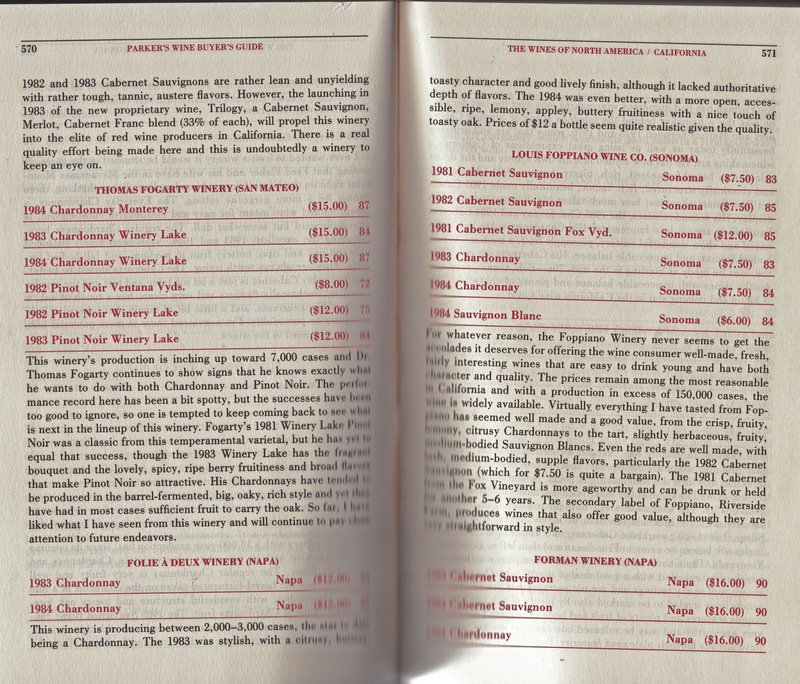 In today's world, where scores under 85 are rarely published, it's shocking to flip through the book and see so many wines with scores in the 70s, often with no comment at all. He calls 1981 Iron Horse Cabernet "acceptable" and lays a 72 on it. This is the exception, though: most scores under 75 get something like this comment about Gerin Côte-Rôtie: "Both the 1978 (72 points) and 1980 (75 points) exhibit annoyingly high acid levels and sinewy, compact personalities." The point is, wines Parker scored in the high 70s back then were wines he probably wouldn't reject at his own dinner table. Back then, when Parker gave a mid-80s score, it was a pretty good wine. "I have liked what I have seen from this winery and will continue to pay close attention to future endeavors," he writes about Thomas Fogarty Winery, which he gives two 87s, two 84s, a 75 and a 72. Today, that group of scores would mean: "Give up and brew beer." He says Foppiano Winery "never seems to get the accolades it deserves" and rates 6 wines, all between 83 and 85. "The Fumé Blanc (J. Lohr) stood out extremely well in several tastings I did for its fresh, lively fruitiness, subtle herbaceous quality, and well-balanced, concentrated feel on the palate." -- 84 points. And what kind of score would you associate with this comment today? "Remarkably vibrant, fruity, flowery, absolutely delicious." It's a Louis Martini sparkling Moscato, which he gives 87. Parker was more shy then about giving 100 points, and it's clear that he didn't taste blind (he still doesn't). Only the big guns scored that high: Mouton-Rothschild, Pétrus. The 100 for Guigal's La Landonne Côte-Rôtie shows his heart lies in the Rhone. As for California, the highest score for any wine was a 93 for the first vintage of Dominus; Parker was well aware Christian Moueix of Pétrus made the wine. Just eight wineries in California made a 92-pointer. There was definitely a double standard, as wines with similar tasting notes in France scored in the mid- or high-90s. I don't know in what year Parker began to see California on equal footing with France, but it clearly came after 1987. Parker likely scored so many wines in the 60s and low 70s because viticulture and winemaking weren't as advanced then. Today's wines are rarely released with the kind of flaws they were 30 years ago; the bottom end today is much better. But does anyone believe today's top-end wines are that much better than 30 years ago? Nowadays wine is much more scientific and predictable. There was a much bigger element of luck in the early '80s. I don't doubt there were fewer great wines then, but the great wines were just as great. Back then they got 91 points. Now they get 98+. And how about those mid-range wines: would anything "absolutely delicious" get below 90 points today? We live in a more absolute era. 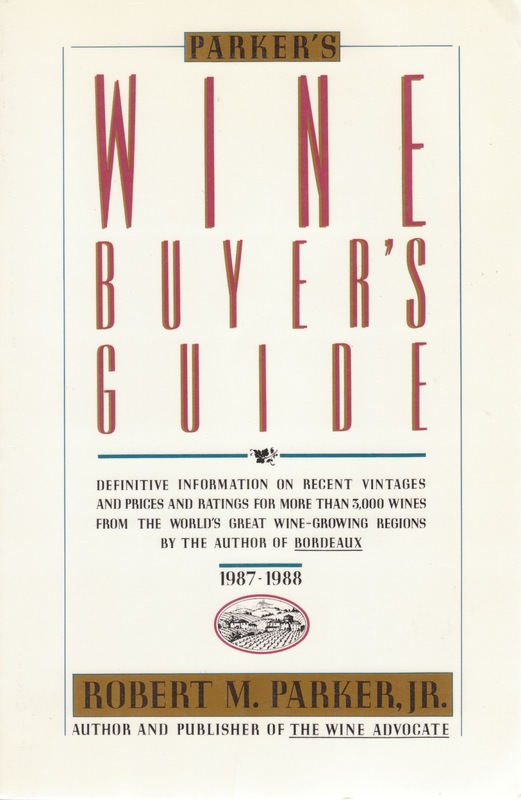 I have that 1987 copy from when I managed a wine store and that was when I noticed I really didn't care much for the style of wines he promoted. I actually prefer the lower rated wines that were made in a traditional style rather than the new world sort of style he pushed. As for climate that is not that much different what has really changed are cultural methods and harvest parameters. That was so wine producers could attain scores from Parker that would help sell their wines. I really wish more would have ignored that as I actually prefer the traditional style wines more. Very interesting post and it points up the fact that nowadays reviewers, including Mr. Parker himself, wouldn't publish such negative comments about wines, I guess for fear that their access would be damaged. You're right though, whether your preferred style of wine jives with Mr. Parker or not, he did have an impact on the drive toward higher quality product. Playing Devil's Advocate, I suspect Parker would counter by claiming that it just proves how his influence and his work helped improve overall wine quality in the world. Including high end wines. I personally think that he was a positive force in the wine world. After his influence became so overwhelming, it stopped being positive as it is often the case when that happens. DAPZ, in fairness to Blake he said as much in the post. Fascinating, Blake. Thanks for bringing this to our attention. I'm 100 points on that. with Robert Parker, publisher of The Wine Advocate. Wine Times: How is your scoring system different from The Wine Spectator's? Parker: Theirs is really a different animal than mine, though if someone just looks at both of them, they are, quote, two 100-point systems. Theirs, in fact, is advertised as a 100-point system; mine from the very beginning is a 50-point system. If you start at 50 and go to 100, it is clear it's a 50-point system, and it has always been clear. Mine is basically two 20-point systems with a 10-point cushion on top for wines that have the ABILITY TO AGE. [Capitalization added for emphasis. ~~ Bob] . . .
Wine Times: Your scores get 50 points added on and look like the grades boys and girls get in school, and I know that's why you ended up with a system with 100 points, but don't you give out too many high grades? THE HIGHEST PERCENTAGE OF YOUR GRADES ARE IN THE 80s AND THEN SOME ARE IN THE 90s. [Capitalization added for emphasis. ~~ Bob] Are there lots of wines you taste that you don't evaluate? Parker: I TRY TO FOCUS ON THE BEST WINES IN THE WINE ADVOCATE, OR ESPECIALLY WHEN I DO THE BUYER'S GUIDE, MY PUBLISHER DOESN'T WANT TO TAKE UP SPACE WITH 50s, 60s, OR EVEN 70. [Capitalization added for emphasis. ~~ Bob] . . .
Wine Times: The answer is partly to give you credibility. Right now the argument is that your average score in The Wine Advocate is in the 80s, and it doesn't matter if its 81 or 84. If it's in the newsletter, buy it. Parker: No. I BUY WINES, AND I BUY WINES THAT ARE 85 OR 86, NOT BELOW THAT. [Capitalization added for emphasis. ~~ Bob] But to me 90 is a special score and should be considered "outstanding" for its type. Wine Times: Do you have a bias toward red wines? WHY AREN’T WHITE WINES GETTING AS MANY SCORES IN THE UPPER 90s? [Capitalization added for emphasis. ~~ Bob] Is it you or is it the wine? Parker: Because of that 10-point cushion. Points are assigned to the overall quality but also to the potential period of time that wine can provide pleasure. And white Burgundies today have a lifespan of, at most, a decade with rare exceptions. Most top red wines can last 15 years and most top Bordeaux can last 20, 25 years. It's a sign of the system that a great 1985 Morgon [Beaujolais] is not going to get 100 points because it's not fair to the reader to equate a Beaujolais with a 1982 Mouton-Rothschild. You only have three or four years to drink the Beaujolais. Parker: 90. That would be a perfect Beaujolais, and I've never given one. have given a lot of 87s and 88s. And it goes back to how I evaluate vintages in general. To me the greatness of a vintage is assessed two ways: 1) its ability to provide great pleasure -- wine provides, above all, pleasure; 2) the time period over which it can provide that pleasure. . . .
Good stuff, Bob, thanks. I wonder when Parker gave up on ageability as a standard? Of course, he has never acknowledged that the low-acid fruit bombs that he likes best generally don't age well. Whether he still follows it or not, I'm not sure, but his website has always claimed that his system assigns points to various assessment categories, just as he described in the interview. I have never heard anyone refer to these details when discussing his point system. I've often wondered if he now uses or ever used a standard form with blanks for the individual scores for each category, which would then be added together for the total score. Or, does he do it Suckling style - I'm 90 points on that? RESPONDING TO YOUR COMMENT ABOUT LOW ACID (AND VERY RIPE) WINES . . . SEE THIS DECANTER ARTICLE. I WONDER HOW LONG AMARONE AGES? COMMENTS, ANYONE ? "Red Wines May Have Premature Oxidation Problems, Say Bordeaux esearchers"
The warnings signs of premox in reds comes through the appearance of certain aroma markers such as prunes, stewed fruits and dried figs, and is often linked to a rapid evolution in colour, as with whites. Dubourdieu, along with Valérie Lavigne and Alexandre Pons at the ISVV, has found two specific molecules - ZO1 giving the prune aroma and ZO2 giving a stewed fruit smell – that develop rapidly in the presence of oxygen. The causes are numerous, Dubourdieu believes: harvesting later in a bid for riper grapes with low acidity, and winemaking practises including too much new oak barrels, or low doses of sulphur dioxide particularly when coupled with a high pH (over a pH of 4, SO2 loses almost all of its effectiveness)." ‘These are practices that winemakers are doing with the best intentions,’ Dubourdieu said. ‘Riper grapes, new oak, low sulphur use – these are all things intended to improve the wine and to benefit the consumer. But I would prefer to warn winemakers now that it’s possible to go too far, rather than say nothing simply to be politically correct. ON THE TOPIC OF ROBERT PARKER ASSIGNING POINTS TO INDIVIDUAL "COMPONENTS" OF A WINE. "I don't know in what year Parker began to see California on equal footing with France, but it clearly came after 1987." 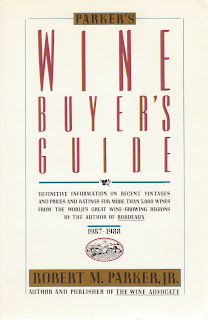 Parker gave his first 100 point score to a California wine -- the 1985 Groth "Reserve" Cabernet Sauvignon -- after his "1987 Wine Buyer's Guide" was published. That brought California into parity with France.